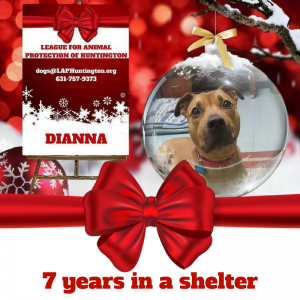 /UCW/ HUNTINGTON, LONG ISLAND, NY – MEET DIANNA…7 YEARS IN A SHELTER, Dianna entered a municipal shelter in 2009 at the age of 2 and languished there for nearly 4 years before being saved from euthanasia in 2013. She currently sits in boarding with limited exposure and no public interest. She is now approaching 10 years old with 7 of them as homeless. Dianna knows basic obedience, walks beautifully on lead, accepts treats nicely and takes great delight in curling up in her blankets. She is extremely smart, very food motivated, low energy, but spry for her age. She loves her toys and bones, and although she needs to work on sharing, is bright enough to make great strides when someone invests their time in her. She would do best in a low-key household with an experienced, savvy individual. Tender and affectionate with those she knows, but suspicious of strangers, she needs slow, controlled introductions with new people but loves unconditionally once comfortable. We seek a home without children or cats, though another dog is a possibility. Dianna is fully vaccinated, heart worm negative, housebroken and spayed. We know that the person who welcomes her into their life will fall in love with her as we have.